Highlight of the week included a group discussion with the U.S.-Japan Council (USJC) President Irene Hirano Inouye, where the students had an opportunity to hear about the work involved in starting and managing a non-profit organization, characteristics of a good leader and ways to contribute to society. The students also spent some time speaking with several other USJC staff in the Washington D.C. office to learn about their jobs and responsibilities. Other highlights of the trip included a dinner with young professionals in Washington D.C., a tour of the United States Capitol and meeting with Professor Hugh T. Patrick, Director of the Center on Japanese Economy and Business at the Graduate School of Business at Columbia University. The students also participated in policy workshops as well as social events where they were able to tap into a vast network of people affiliated with the TOMODACHI initiative. 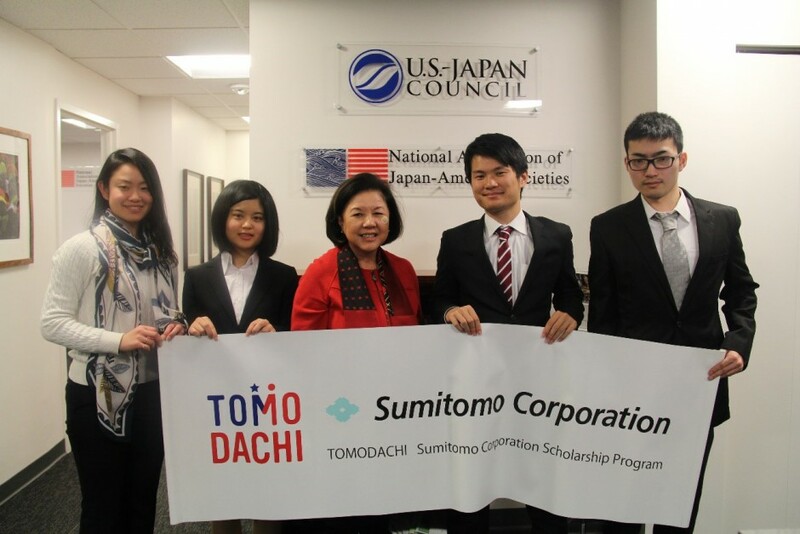 One of the TOMODACHI Sumitomo Scholars, Kiyoka Oyabu, currently studying in Linfield College in McMinnville, Oregon, commented that the professionals she met during this trip gave her inspiration and motivation to study harder to pursue her goals. Another scholar, Kazunori Kasahara, currently studying in University of Washington, Seattle, Washington, was inspired to learn the inner workings of the USJC and the significance of role identity that plays in its activities. Students completed their trip with a dinner in New York joined by the regional USJC members including Susan Onuma, Kenshiro Uki, Jaime Sugino, Jona Higa and others.